To stay clean and remove all the dust from your homes, buildings, RV’s, cars, trucks, boats, decks, driveways, patios, lawn equipment, and much more Sun Joe SPX3000 2030 PSI 1.76 GPM Electric Pressure Washer is one of the best pressure washers available in the market. In your busy life if you are in a hurry or don’t want to waste your all day in cleaning the grease from concrete, heavy mildew stains, oil stains, rust from steel, caked mud on equipment, and other stubborn gunk and grime it can assist you like your loyal attendant. This electric pressure washer can help you clean the above mentioned by sending waves of pressurized water to the area you want to clean. Being an electric pressure washer while using it is almost noiseless, unlike the gas operated pressure washers. Snow Joe is a well-known company specialized in designing and developing high-quality and affordable outdoor tools to keep your house clean and beautiful. Sun Joe SPX3000 2030 PSI 1.76 GPM Electric Pressure Washer is one of their best inventions which included all the cutting edge facilities and fulfilled all the criteria required to make it one of the best Pressure Washers available in the market. Understanding the needs of its users the device is provided with five quick-connect spray nozzles. It is easier to interchange nozzles to quickly go from a high pressure 0 pencil point jet to low-pressure 40 fan spray. At the surface, it has a soap nozzle or applies detergent for a thorough and effective cleaning. 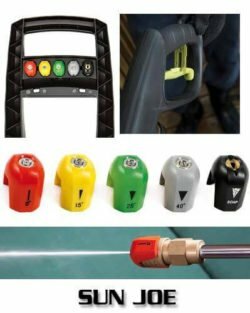 To save energy and to prolong the pump life it has TSS (Total Stop System) which automatically stops the pump when the trigger is not in use. There are two detergent tanks and you can easily switch from one detergent tank to the other by a convenient switch while cleaning. The manufacturer company gives the features a 34-inch extension spray wand to access hard-to-reach areas, and it has 2-story buildings and the undersides of automotive vehicles and lawn equipment. Plus, its rear wheels provide easy portability around your yard. Powerful Motor: The strength of the motor presents how the pressure washer will perform. A good and powerful pressure washer means having a strong and powerful motor in it. It helps you with a good cleaning in a large scale. 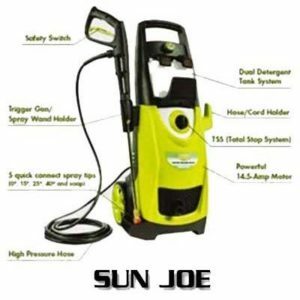 Sun Joe Pressure Washer has a 14.5-amp/ 1800-watt motor to make washing more effective. The users appreciates the power of the engine. TSS (Total Stop System): The Company, Snow Joe thinks about saving the electricity by putting the automatic stop system in the machine. The machine shuts off the pump when the trigger is not engaged thus saves energy and prolongs the motor’s life. Dual Detergent Tank: It provides you with two detergent tanks that are to contain different types of detergents. So that you can use them simultaneously to clean different types of dust. The two tanks are removable and 0.9 L onboard. Different Spray: While cleaning people face the problem with the same kind of spray to clean different kinds of dirt. 5 quick-connect spray tips (0, 15, 25, 40 and soap) handle light, medium and heavy cleaning project. Warranty: The machine comes with two years of warranty and is CSA listed. So, you don’t have to worry about its manufacturing defects. You can use your money in buying other important things. Sun Joe spx3000 Pressure Washer doesn’t come with easily usable instructions. It doesn’t provide a proper manual guide which can be a little problem for the amateur user. The professionals can easily assemble the device. It will take very less time to the new users to get familiar with the system. They used plastic material and it can leak and become hard to connect. We believe that you are concern about your money and want to put it to best use. Sun Joe SPX3000 2030 PSI 1.76 GPM Electric Pressure Washer can be your best option. The performance of this device gets many appreciations by most of the users and it is cost effective. The two wheels make it very easy to carry the device to anywhere you want. The product’s weight is only 31 lbs that make it easy to lift to any story of the building if you need. Its 35-foot power cord comes with GFCI protection to allow your full safety while using. The facility it provides is much more worth its price. So, if you have a limited amount of money in your pocket and want to buy the best pressure washer then this device can be your best option. It is one of the best and widely sold pressure washers available in the market. Click To Buy it Now on Amazon with Latest Price! I tidied the form up of our bond patio, wash autos, that really works fine too. The hose length is adequate for me. The weight is excellent for a little unit and I have had no issues up until now. I am so satisfied with this power washer. More comfortable to use. A lot more advantageous than gas-controlled ones. Washing the house, the metal rooftop underside of our deck, washing driveway, patio and that’s also best for a wooden surface. Thanks, Jones. We are pleased that our suggested product has helped you. Keep in touch to get our latest product review, specifications, and tips & tricks.